Some present irregular verbs Spanish. 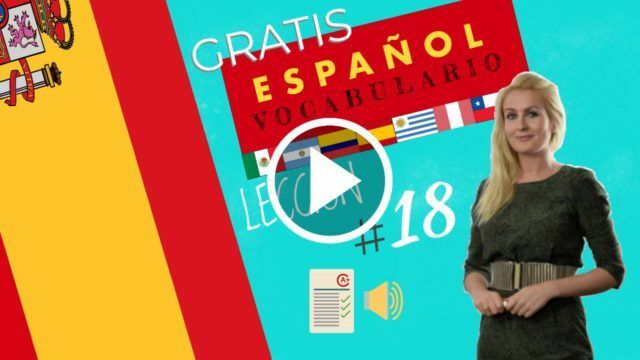 Dialogue in Spanish with English subtitles about the present irregular verbs Spanish. Esteban: Ufff. Esto parece una típica trampa turística. Aquí sólo sirven paella y sangría. Con sólo esas dos cosas, los extranjeros parecen completamente satisfechos. Alba: What do you want to eat? Esteban: Ufff. This looks like a typical tourist trap. Here they only serve paella and sangria. With just those two things, foreigners seem completely satisfied. Alba: I’m so hungry! Yes, the seafood is very good, especially the lobster but I am vegetarian. I will order a vegetable paella … No, a mixed salad. A mixed salad is better than a vegetable paella. The diners order the dishes from the waiter. Sometimes some of Alba’s friends do not understand the waiter because he has a very strong accent. They do not study in their academy and their pronunciation is worse than that of the students of this academy. Alba translates sometimes. Then, they start eating and drinking. They also make a toast. Alba: A toast to us and to our Spanish! For the best friends in the world! Should we order another pitcher of sangria, guys? All: Yeeeeaah! Let’s continue on the sangria, please. We want a bigger pitcher than the previous one! Esteban: Everything is very good. Now I understand why we are in this restaurant and not in another. The restaurant opposite is less varied than this one. And also this one is cheaper than that one. This is the best. Next week, I’ll be back again. Alba: So will I. What do you want for dessert? Esteban: I want an ice-cream with chocolate and strawberry syrup. Alba: Now I understand why you still have love handles and you can’t lose weight. Esteban: It’s not possible! I eat as much as you. Alba: Not at all! You are lying! I do not eat as many sweets as you. Los niños siempre meriendan un bocadillo. El camarero sirve la sopa. In Spain the stores close very late. When you have to conjugate an irregular verb that belongs to this conjugation with two vowels E in the root, you must change the second one by IE. Children always snack on a sandwich. I do not understand this lesson. The waiter serves the soup. In this group of verbs, the voice E of its root changes to I. For example: Do I repeat the explanation? In the last lessons we studied a type of present tense that changes the vowel of its root from -O to – UE in all people, except for WE and YOU (PLURAL FORM). Esteban piensa que es una tramp turística, y sólo sirven paella y sangría. 1- What does Alba plan to do first? First Alba plans to organise a meal at a fast food restaurant. 2- What does Alba decide in the end? In the end, Alba prefers to organize a dinner in a restaurant with Spanish cuisine. 3- What does Esteban think of the restaurant? Esteban thinks it’s a typical tourist trap, and they only serve paella and sangria. 4- Why doesn’t Esteban want meat? Esteban is on a diet but isn’t losing weight. He prefers fish, which is healthier than meat. 5- Why can’t Alba order fish? Alba can’t order fish because she is a vegetarian. 6- Do all of Alba’s friends understand the waiter? No, some of Alba’s friends do not understand the waiter because he has a very strong accent. 7- Why does Esteban prefer the restaurant that Alba has chosen? Because the restaurant is more varied and cheaper than the restaurant opposite. 8- What does Esteban want for dessert? Esteban wants an ice-cream with chocolate and strawberry syrup.